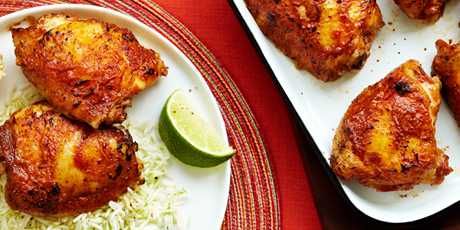 Tips: For an authentic dining experience serve this with basmati rice and warm naan bread. This recipe works well with any chicken pieces. For a cool and casual treat try it with chicken wings and a homemade, or store bought, mint-yogurt dipping sauce. 1. Combine cream stock, garlic, ginger, lemon and spices in a large resealable bag and mix well. 2. Add chicken thighs to bag and toss, ensuring they are well coated. Marinate in the refrigerator for 2-3 hours (up to overnight for a more intense flavour). 3. Remove chicken from marinade and transfer to a roasting pan. Bake for 30 minutes or until fully cooked at 350°F (180°C) or grill chicken on a BBQ.